As Maria von Trapp well knew, Vermont and the Austrian Alps have a few traits in common: rolling mountains, dense alpine woods and long, snowy winters. What Vermont doesn’t share, though, is a distinctive cold-weather cuisine. In Austria, winter fortifiers include schnitzels, strudels and dumplings, some of which the von Trapps began serving almost as soon as they opened their lodge in Stowe in 1950. More than 60 years later, the Trapp Family Lodge hasn’t entirely shaken the fusty image of waitresses in dirndls and silver-haired tourists, but it has evolved into a buzzing hive of passionate food producers working away in their respective corners of what some call “the campus.” That includes the main lodge kitchen, a bakery, a brewery and even a log cabin half a mile up a mountain. On a recent frigid day, I spend morning, noon and night eating at Trapp’s and find myself taking an excursion into rib-sticking Austrian fare — with modern touches. In his menus, Lambrechts is just beginning to play with local cheese and the Highland beef raised in the nearby fields; in the summer, he will use herbs, vegetables, berries and other bounty from the lodge’s garden. He respects the broad strokes of Austrian cuisine, but that doesn’t keep him from tinkering with the details — such as during the epic, almost medieval breakfast buffet. On one plate, I load squares of saucisson sec, mortadella and Cabot dill-and-chipotle cheddar; smoked salmon with capers and cucumber wedges; a croissant; steel-cut oatmeal with maple syrup; cantaloupe, honeydew and blackberries with yogurt; some creamy scrambled eggs, crisp bacon and a curl of breakfast sausage; and a small, sticky cinnamon bun. I haven’t room left for the French toast or the muesli, served on a bar loaded with bowls of coconut shavings, dried raisins and cranberries, sunflower seeds, brown sugar, and nuts. 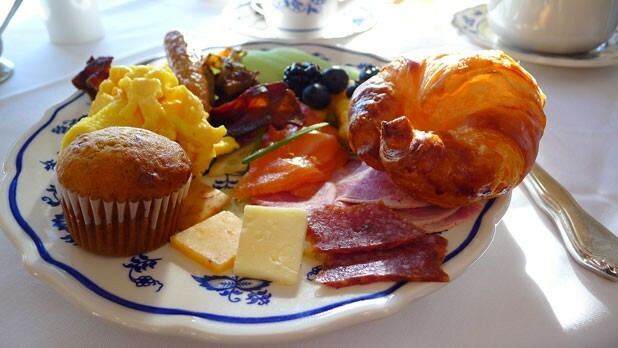 Visitors should go big at breakfast, because almost all that fuel is needed for the climb to Slayton Pasture Cabin, one and a half miles up the slopes of Round Top Mountain. The cabin is reached via a tangle of interlocking, sometimes-steep cross-country ski trails, starting with broad Sugar Road. Despite the 17-degree air and the ice left by rain two nights before, I set off, motivated by visions of hot chocolate, or perhaps a grilled cheese sandwich, deep in the conifers. I am grateful for his soup and a well-tended fire. For 11 years, the lanky Gora has served up the basics in this toasty cabin. Daily, he cooks massive pots of soup with provisions trucked up by snowmobile. Today, a steaming lentil soup teems with chunks of potato and carrot, and has a sharp kick. “I put cayenne in there,” Gora admits. “Soup is very forgiving.” Skiers can also choose from meat or cheese sandwiches, cookies, soda and hot cider, and even bars of Ritter chocolate. It’s a quiet day in the snug cabin, according to Gora: just me, an older gentleman named Russ and a woman from Ontario who jabbers loudly on her cellphone, seemingly oblivious to the pastoral scene. I settle in by the fire with a treacly-sweet hot chocolate, pondering the catastrophe that may await when I slide back down the trails. Like an angel, Russ gives me a quick lesson on improving my snowplow before swishing off. His erudite instruction helps me avoid a crash on the descent, even as my skis scrape and swerve against the ice. Back on the main campus, about a quarter mile down the road from the outdoor center, is an oasis where bedraggled, trembling-thighed skiers can find a warm fire, fresh beer, sandwiches and Sachertorte: the DeliBakery, formerly the Austrian Tea Room. Here, the glass cases gleam with ornate German and Austrian cakes, and a chalkboard lists soup, quiche and sandwiches. The most Austrian among them is a delicious bratwurst served on a crusty bun with tangy sauerkraut and sharply spicy German mustard, its heat softened by creamy red potato salad on the side. Back in Stowe, van Anda applied his passion to the crisp Trapp Golden Helles; the deeper-hued and nuttier Trapp Vienna Amber, a relatively rare style; and the maltier, caramel-colored Trapp Dunkel Lager. He also brews three seasonal ales per year, including this winter’s smoky Trosten Bier, a black lager. It all flows freely upstairs at a wooden bar inside the DeliBakery, and also at the lodge’s lounge, where yet another fire flickers. Here you can wear jeans and order from either the casual lounge menu or the tonier restaurant menu, while avoiding the formality of the dining room. Chef Lambrechts says he “loves taking older recipes and modernizing them.” That includes the tried-and-true standbys at the the lodge — namely braised beef and Wiener schnitzel. The braised Highland beef, he notes, used to be heavier and cubed. Now Lambrechts braises the meat “for a very long time” in red wine and herbs, rendering it velvety and almost sweet. Slathered on oblong crostini with curls of sautéed spinach and tartly pickled red onions on top, it turns the cheeks rosy. Lambrechts gently tinkered with the almost-sacred Wiener schnitzel, an Austrian staple and the most long-standing, popular dish here. “To me, with a Wiener schnitzel, it is very important to squeeze the lemon over it, for flavor,” he says. “But I was seeing some plates come back to the kitchen with the lemon untouched.” So he began adding lemon zest to the breading, along with Parmesan cheese and herbs. The veal escalopes of his dressed-up version are still earthy and crisp but laced with brightness. Schnitzel is so filling, though, that dessert has to wait until the next day. Back in the DeliBakery, pastries such as Black Forest cake, Sachertorte and an almondy Linzer torte emerge from the ovens each morning, bathing the room in spicy and nutty aromas. Chief among them is a warm, overstuffed apple strudel, another crowd favorite. The Sachertorte — layers of chocolate ganache and apricot jam — is ridiculously dark and dense, its intense chocolate shot through with waves of fruity sweetness. “I miss the old Black Forest cake,” laments a longtime Trapp-goer from Massachusetts, perusing the items in the case. He uses his hands to emulate an imaginary hulking chocolate cake surrounded by clouds of whipped cream. Pastry chef Robert Alger, who has been at Trapp a year, listens politely and then extols the virtues of the updated version: layers of chocolate and kirsch mousse, topped with whipped cream, chocolate shavings and Griottines — which are also hidden inside. The customer shrugs and says it looks too fancy. “It’s a new generation coming in. We’ll be the last of ours,” he adds, then orders a ham croissant instead. The reimagined cake? For our money, it’s as sweet and heavenly as a freshly groomed Sugar Road.